Here’s yet another imaginative game to be added to Easyslots. The Developers at NetEnt have literally put a unique spin on a classic five-reel slot. 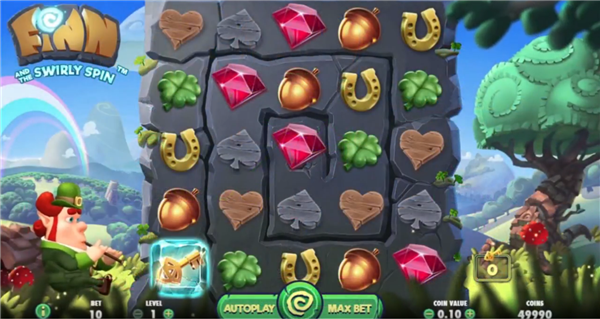 The use of a swirling pattern on the reels being critical to the gameplay as it is the key to unlocking the games free spin bonus feature. The game offers a fun and friendly Irish theme with a very stereotypical Irish character to help you along your way through the spiral reels. Not to forget the quality cartoonish artwork in the backdrop. You can read more about how to deposit by mobile slots. Irish Luck: A horizontal or vertical line will transform to all the same symbols, giving a win and an avalanche. Starfall Wild: Between two to five extra wilds will spawn randomly on the reel. Dragon Destroy: A random number of symbols will be destroyed, activating an avalanche. Magic Transform: All spades and heart symbols converted to high paying symbols. Star Bar – Requires one key to unlock and grants seven free spins, after each spin Starfall wilds will trigger. Lava Lair – Requires four keys to unlock and grants three free spins, each spin will trigger the Dragon Destroy. Lucky Mug – Requiring nine keys to unlock and grants four free spins where after each spin the Irish Luck feature triggers. Golden Pot – Requires sixteen keys to unlock, granting you two free spins where the magic transform triggers after each individual spin. Check out our uk slot promo here! Overall, this slot offers a unique new design to the slot market, with a wealth of additional bonus features that Finn has to offer you there’ll be plenty opportunities to build up your own pot of gold. The overall theme is typical of an Irish slot but done perfectly with great visuals and an amusing character. If you enjoyed this slot you could try Twin Spin Slot.